The blogosphere is well suited to the coverage of extended journeys or endurance achievements; there have, in recent years, been several excellent blogs written by cyclists (Tom Kevill-Davies’s The Hungry Cyclist and currently Alastair Humphreys’s terrifically entertaining blog covering his round the world cycle ride are just two of them) and a few of these have been the catalyst for full length books, proving not only the enduring popularity of cycling but just how much the public’s imagination i-s fired by tales of such feats of strength, daring and will to succeed. 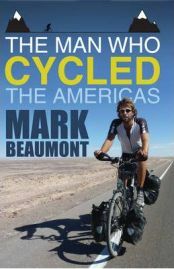 Following on from “The Man Who Cycled the World”, an account of his record breaking trip of 2008, “The Man Who Cycled the Americas” is Mark Beaumont’s next major undertaking, cycling down the back bone of the continents of North and South America. Having generated a lot of media attention with his first feat, this time BBC Scotland was commissioning a three part television series around the trip. With little experience as a mountaineer – Scotsman Beaumont confides that he hadn’t even climbed Ben Nevis – it may seem incredible that he chose to climb Denali in Alaska (better known as Mount McKinley) and Argentina’s Aconcagua at the start and end of his trip, significant achievements in themselves. Of the Seven Summits (the highest peak on each of the continents) these two mountains are third and second respectively. I have to confess that I haven’t read the first book, but I have seen the one hour documentary that was screened on BBC television. He’s an immediately engaging chap who has an ability to get on with everyone and this is evident here in his account of his trip. While he devotes a little space to introspection – I guess a mammoth cycle ride is the place to learn about yourself and your capabilities – there’s a good balance between the physical and mental aspect of this kind of undertaking and the coverage of the journey. However, I did feel that the edginess of the challenge was dulled somewhat by the rather organised structure of the challenge because Beaumont had cycling companions for sections of the trip, and had regular contact with radio stations and other media outlets back home. On the other hand, the lessened feeling of excitement and spontaneity that comes from a solo trip provides a space to be filled with accounts of the people that Beaumont meets along the way and there is plenty of scope for a more conventional travelogue, so while this undertaking may not have had the edge of a solo trip, Beaumont got to spend time actually appreciating the places his ride took him through, something he regretted not being able to do on the first trip. Beaumont’s enthusiasm for discovering these cultures and sights is certainly infectious. There’s a wonderful section where he meets up with a woman in Montana – cowboy country – who takes him out horse-riding in what is some of the USA’s most stunning country: I was truly envious. One of the highlights of Beaumont’s writing is the way he captures the subtle nuances of life for ordinary people in South America; there are a number of sensitive and charming portraits of families who befriend him and delicious meals cooked by people who have little but want to share what they have. And if you’ve ever wondered it’s like to eat guinea pig, now’s your chance to find out. The Man Who Cycled the Americas is a brilliant read that really captured my imagination; while I’ll never have the determination and strength to achieve what Mark Beaumont has done, I’ve long harboured a yearning to do a long cycle ride and this book has re-fired that desire. Far from being a dry account of the ordeal of such exertions (though Beaumont does capture both the highs and the lows) this is travelogue stands out from most cycle-trip memoirs and that’s down to Beaumont’s engaging narration. It’s refreshing to read a travelogue that is based mainly on experience and observation rather than weaving in endless facts. I wonder where Mark Beaumont will take us next? Thanks to Bantam Press for sending a review copy. No Comments on "The Man Who Cycled the Americas"